Your proceedings are clouded by illegitimacy. . . . First, most of your meetings are secret, apart from two open sessions before this one, which were plainly for show. There is no justification for secret meetings on deficit reduction. No secrets of any kind are involved. . . .
Second, that some members of the commission are proceeding from fixed, predetermined agendas. Third, that the purpose of the secrecy is to defer public discussion of cuts in Social Security and Medicare until after the 2010 elections. You could easily dispel these suspicions by publishing video transcripts of all of your meetings on the Internet, and by holding all future meetings in public . . . Conflicts of interest constitute the fourth major problem. The fact that the Commission has accepted support from Peter G. Peterson, a man who has for decades conducted a relentless campaign to cut Social Security and Medicare, raises the most serious questions. 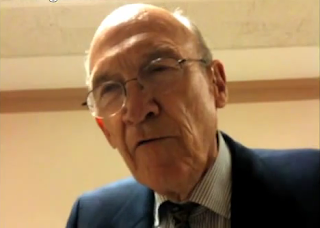 That's why Commission co-chair Alan Simpson -- with his blunt contempt for Social Security and and other benefit programs (such as aid to disabled veterans) and his acknowledged eagerness to slash them -- has done the country a serious favor. His recent outbursts have unmasked this Commission and shed light on its true character. Unlike his fellow Commission members, who imperiously dismiss public inquiries into what they're doing as though they're annoying and inappropriate, Simpson -- to his genuine credit -- has been aggressively engaging critics, making it impossible to ignore what the Commission is really up to. In June, he walked out of a Commission meeting and proceeded to engage in an amazingly informative, 8-minute colloquy streaming in real time on the front page of FDL, making unambiguously clear that the Commission is working to cut Social Security benefits. And over the last several weeks, he has used increasingly flamboyant rhetoric to attack both defenders of Social Security and the program itself, as well as even attacking wounded veterans for failing to sacrifice enough by giving up some of their benefits. Whatever one thinks of Simpson's remarks, I prefer his public, engaged candor to the extreme, arrogant secrecy of his fellow Members. So why not campaign all-out, in [Tip] O'Neill’s plainspoken way, against a GOP that is disloyal to the most successful -- and most popular -- social program in American history? Because Democrats have been disarmed by the president's deficit reduction commission, which plainly intends to propose Social Security cuts. Rather than allow such cuts to be greased through the lame duck session of a decimated Democratic Congress, or passed under cover of "bipartisanship" in a decidedly more Republican one next year, shouldn't the case be stated and debated before the election? (Right now, Social Security is treated as the issue that dare not speak its name.) There is also the question of Democratic identity: What does the party stand for if not Social Security? And then there is the question of Democratic stupidity: Qualified and muted comments by Democrats in effect suggesting that Democrats won't endanger Social Security as much as the other guys will can only further pave the road to defeat. The president's deficit reduction commission was a response to a series of popular myths -- that the federal deficit is a root cause of our economic distress and that Social Security is a root cause of the deficit. . . . So the deficit commission has targeted Social Security, which has nothing to do with the deficit. Simpson's comments have triggered a parade of similar evidence. Key Democratic House member Chris Van Hollen pointedly refused to vow that Democrats would vote against Social Security cuts when pressed by MSNBC's Cenk Uygur, and several progressive pundits -- including TPM's Brian Beutler and Ezra Klein -- this week documented what has been clear for some time: that the Commission is stacked with ideologically conservative and corporatist appointments from both parties likely to recommend cuts in Social Security. But perhaps the most significant result of Simpson's candor is that Obama loyalists and Beltway media voices are now forced to publicly defend Social Security cuts, because Simpson's comments have prematurely dragged out into the open what has been an open secret in Washington but was supposed to be a secret plot for everyone else until the election was over. The New Republic's Jonathan Chait recently decreed, in response to the Simpson controversy, that "liberals should be open to Social Security cuts as part of a balanced package of deficit reduction." And in The Washington Post today, both the Editorial Page and Dana Milbank defend Simpson and call for cuts in Social Security (Milbank even defends cuts in aid to wounded veterans). That Social Security must be cut is not only a bipartisan consensus among the GOP and "centrist" Democratic wing, but at least as much, among the Beltway media establishment. One of the most significant developments in the U.S. is the rapidly and severely increasing rich-poor gap. A middle class standard of living is being suffocated and even slowly eliminated, as budget cuts cause an elimination of services that are hallmarks of first-world living. Because the wealthiest Americans continue to consolidate both their monopoly on wealth and, more important, their control of Congress and the government generally, we respond to all of this by enacting even more policies which exacerbate that gap and favor even more the wealthiest factions while taking more from the poorest and most powerless. And now, the very people responsible for the vulernable financial state of the U.S. want to address that problem by targeting one of the very few guarantors in American life of a humane standard of living: Social Security. Advocates of cutting Social Security -- like Jonathan Chait and the Post's Fred Hiatt -- are the same people who cheered on the attack on Iraq and other policies of endless American War, which have drained America's budget and turned it into a debtor nation. Millions of other human beings -- but not, of course, them -- suffered and sacrificed for those policies. And now that it's time to address the economic carnage caused by all of this, to what do they turn for savings? The handful of social programs which provide at least some small guarantee of a minimally decent standard of living in old age. Even those who are ideologically opposed to "social programs" as confiscatory or "socialist" should find this glaring disparity in treatment highly objectionable. The government policies which most benefit the wealthiest -- the owners of the Government -- continue unabated: endless war, private Surveillance State explosions, Wall Street bailouts, too-big-to-fail banks, perhaps even extending Bush tax cuts, while the programs on which the most vulnernable depend are targeted to pay for all that. There have been some gestures during the Obama presidency to work against this trend -- most notably the increase of health care subsidies for millions of poor people -- but targeting Social Security in order to pay for wars, to feed the private Surveillance State, and to extend Bush tax cuts or the suspension of the estate tax is pernicious no matter one's economic ideology. This isn't about free market capitalism; it's crony capitalism -- oligarchy -- where government policies are constructed to transfer wealth to the same small faction at the top. In the Post today, Milbank justifies the targeting of Social Security recipients and wounded veterans on the ground that nothing should be "sacrosanct" when considering how to solve America's deficit problem. Leaving aside the fact that Social Security is not really a deficit issue, the true causes of America's debt and deficits are absolutely sacrosanct and will never be attacked by this Commission. Does anyone believe it's even remotely possible that meaningful cuts in America's war and military spending, surveillance and intelligence networks, or even corporate-plundering of America's health care system will be enacted as a result of this Commission process? Of course not. Those genuine debt-causing policies are "sacrosanct" because the people who profit from them own and control Washington (and share common socio-economic interests with the millionaire Commission members targeting social programs and the billionaires who are behind this). It's the people who don't control Washington -- ordinary Americans who need Social Security -- who are being targeted in order to feed even further the fattest, most piggish factions actually in control. That's what makes this process so ugly and odious. UPDATE: The 8-minute Simpson video I linked above is apparently difficult to hear unless you use headphones. That's recommended, but for those who don't do that, the transcript of that colloquy is here.